The Man from Madras Musings thinks it was Shakespeare who said that there were sermons in stones and books in running brooks. That was the first quote that came to mind when MMM was asked recently to release a book commemorating 90 years of the oldest Rotary Club in the city. MMM, while preparing for the speech, had a whale of a time putting together the various experiences he has had in bringing out books and the words of encouragement he has received at the end of each. Years ago, MMM sweated himself to the bone and produced a tome of a book, his first. At the end of the book release event, the person who had commissioned MMM patted MMM on the back and whispered, “Don’t worry, nobody will read it anyway.” MMM was quite nonplussed but, later, on pondering over it, came to the conclusion that this too was all to the good. After all, if there is a voluminous book with MMM’s name on the cover that should be enough to establish MMM as a man of letters. Forget what is inside. Over the years, MMM has arrived at certain fixed conclusions on books, especially of the coffee-table variety in the production of which he, MMM, has been particularly fecund. Around 90 per cent of those who get these books run their hands over the cover and then consign the book to some coffee table or the other. MMM is quite happy if they don’t consign them to dust bins. Of the remaining, around five per cent go through the pages, glancing at the pictures. We now come to the last five per cent and here is where the writer is on slippery ice. Two per cent look into the index and scan to see how many times their name appears in the book. If it is there a sufficient number of times, all is well and they write letters praising the work. If not, all hell can break loose. Of the remaining, two per cent is really tricky for this is the kind that after searching for its name will scan the list for its enemies and see if they are also featured. If not, all is well. If they are, then a rapid count is made as to the number of times they feature vis a vis themselves. If the enemy count is higher, the book is trashed. If not, there is scope for some backhanded compliment. The last one per cent is the kind that will actually read the book line by line and send you a list of errata. Dust jackets can be quite devious too. On one occasion the Chief Guest held on to it while the book happily slid out and landed with a thud at the Chief Guest’s toes. The public address system resounded with strange oaths in a native language. The High Court of Madras gave the Government of Tamil Nadu a list of heritage buildings in the city that it felt ought to be protected. This listing was put together by a committee formed by the High Court especially for this purpose. The listing had copious notes on the history of each structure, its state of preservation and also a suggested category of grading into which each edifice could be placed. The Chief was part of this committee and when you read the report, which runs into several hundred pages and weighs a tonne, you can hear his voice coming through, loud and clear. This document was given to the Government 13 years ago. Considering that it had come from the High Court and was part of a judgement, you would think that the document would have been accepted in toto. But this is a democracy and how can any Government accept blindly what the Judiciary hands out? And so the Government decided that it had to independently list out the heritage buildings. And to do this it decided that it would rather not trust the historians and architects who worked in the High Court committee but instead place its confidence in undergraduate students in the various engineering colleges that dot the State. These have of course been using the original document (which is now helpfully on the web) and cribbed all of its contents for their own reporting. The only surprising element is that while the original committee put together a list of 468 buildings in a few months, the various students of the numerous colleges have, even with the original report in their possession, managed to list just 60 buildings or so in the past 13 years. Last week, a couple of young things called MMM. They had, they said, a few questions on two heritage structures. They had originally called on the Chief and he had directed them to MMM. It did strike MMM in passing that a wonderful photo opportunity was missed, due to the absence of a photographer, in catching the Chief’s expression when the two young things asked him about the two heritage structures. Be that as it may, the two young things were now supplicating MMM for information. The two spots, one a long-vanished viaduct (only you could have played such a trick, Chief) and another an obscure park had MMM scurrying for information himself. It then dawned on MMM that these two young things could get information on the two old things by simply accessing the original report. He asked them to do that whereupon he was supplied with the most original answer – the relevant pages were missing in the copy that is doing the rounds. MMM recollects that a popular Tamil film in recent years had the title Some Pages Missing in the Middle. That would be a good title for this column too. Who says Chennai Police lack a sense of humour? The Man from Madras Musings chuckled at this poster that is now at various intersections. The genre is somewhat noir, but then you cannot deny that the message is quite clear. 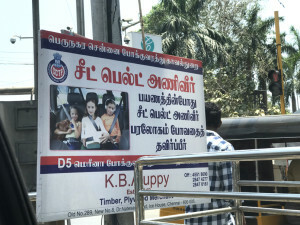 For those who cannot read Tamil it says Wear Seat Belts While Travelling and Prevent Your Journey to Heaven.